Deflections: Should a coach swear? About six years ago, I began guitar lessons. My teacher, a musician and sound technician, started me with basic skills on a fretlight guitar, one which lights up to show where you put your fingers. It was as frustrating as could be. I felt like a five-year-old trying to pick up a hockey stick for the first time without falling. Never mind skating (i.e. playing a song). Not once did he swear at me. If he had, as an adult, I likely would have sworn right back at him. Or stuffed a guitar pick up his beak. But for some odd reason music teachers don’t swear at their students, no matter how awful they are. When my daughter was in a community drama troupe, the director didn’t swear either. Come to think of it, not once in my 36 years of teaching did I ever hear or know of a colleague who swore at their students. Why it’s accepted in minor hockey leaves me baffled. What would these coaches say if the grade seven teacher snapped at their children to learn their %$#! !&$@$ rules of equations? Here’s a tale for you. The coach of a AAA team of kids less than 15 years old had a disastrous season. He was incapable of controlling them, taught little, and often showed poor self-control. His competence was frequently questioned by parents who wanted him removed in October. Others though didn’t want to cause a stir lest their boys be black-balled. Complaints to the association were frequent. Nothing was done. They limped to the end, happy to be rid of each other. He frequently swore at kids in practice from the outset. When asked my thoughts on it, I said this was a deal-breaker. If a coach of young boys has to resort to that kind of language, he doesn’t belong. I’d rather have a weaker technical coach but one who respects the boys and his position. This fellow demonstrated neither. He should have been dragged by his tongue into a board meeting and told plainly to clean up his mouth or he’d be gone. It never happened. To some degree then, I blame the association for not stepping in, but that’s another discussion. 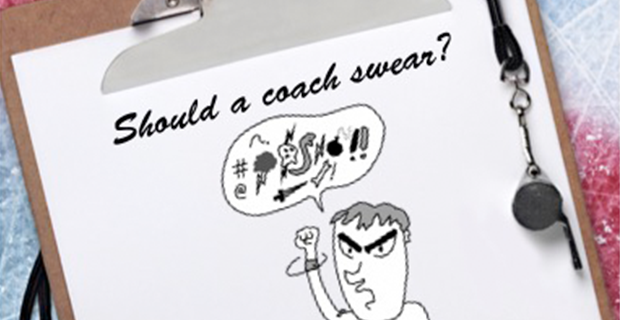 The minor hockey culture doesn’t overtly tell coaches that swearing is unacceptable. Why not?